Here’s the latest number in tech that’s got people talking; WhatsApp is now sitting on 900 million users. That’s more than impressive for a platform that is focused on Instant Messaging and voice communication with no major offline advertising strategy. This latest bit of news on WhatsApp reinforces what users, fans and even the naysayers of the app or any other Instant Messaging app have come to accept: people will always rush to use solutions that are simple to understand and make sense from an economic standpoint. So it shouldn’t be a surprise that Zimbabwean mobile subscribers have the same sentiments. We all love Instant messaging, and thanks to Net Neutrality violations, we love “WhatsApping” in particular. Reasons like cost, familiarity, and peer pressure are pretty obvious. But, as an add-on to all this our mobile networks made it even more appealing with WhatsApp bundles – those $3 and $6 monthly subscriptions that give us unlimited access to the IM platform. This helped boost Average Revenue Per User (ARPU) for the mobile operators and helped shine light on the fact that even in Zimbabwean telecoms, the future is in data services. At the same time, it weaned people off voice calling. Now, every quarterly report from the telecoms regulator, POTRAZ and every operator’s financial report has utterances of how services like WhatsApp are one of the major contributors to a faster fall in voice revenues. The cries from the operators grabbed the attention of the Ministry of ICT. When the infrastructure sharing issue was still being thrashed out, the Minister of ICT, Supa Mandiwanzira mentioned how he had given operators the option to table suggested solutions for dealing with the challenges that they are facing, including the effect of Over The Top Services. It will be up to the Ministry of ICT to determine whether the actions that the operators propose are worth enforcing, and though nothing has been brought forward by the operators (except the proposed framework for infrastructure sharing) it’s safe to assume the issue of voice revenues and the factors accelerating its decline are what the operators want to be addressed. This reality was reinforced by the latest POTRAZ report. A 14.2% decline in telecoms revenue can be partly blamed on our flailing economy, but the drop in voice revenue has also had a huge impact on the operators’ bottom lines. Reversing the tariffs reduction which was effected on voice calls doesn’t look like it’s going to happen any time soon, (the Minister of ICT is on a tariffs reduction warpath and POTRAZ ‘s strong efforts on new pricing already rule that option out) and just removing WhatsApp bundles won’t work (subscribers would still use IM) so banning OTT services like WhatsApp might just be what these operators will consider. If it is presented as an alternative from the operators, the Government, through the Ministry of Finance (which is receiving lower taxes from the operators) would gladly sign off on that. This would be a decision based on revenue and preserving an industry that has contributed significantly to state coffers. Besides, we wouldn’t be the first country to do this. Maybe kwaa kuneta (being late afternoon and ndadya sadza) but I think article iyi haina dhiri? Should have been a tweet rather than article maybe? Or maybe haana kunyora enough articles akutsvagiridza kuti zvikwane. In most countries which ban whatsapp, the reasons given are “security” reasons. If our gvt then go ahead and ban whatsapp because our MNO companies are failing to adapt to modern demands of society, that will be a big sorry decision. It can also ask the gvt to ban telco companies because people dont write letter any more, they jus call or send a text. On a different note, we are are trying to attract and modernise our economy, then we go ahead and ban companies that think and act modern!! I agree, the article is more speculative than fact. Technologies are changing and companies should adapt to new challenges or die. Period. In the next 5 years , there could be another app which might overtake WhatsApp. What will the govt do ? Imagine if governments had banned airplanes to protect buses and railways!!! Ah, iwe unoziva chinzi Average Revenue Per User (ARPU)?? everywhere in the world ARPU is declining because of OTTs then iwe woti WhatsApp improved ARPU? This is one of the dumbest articles I have ever read on techzim. Come on guys!! The move away from voice calls is as much (maybe even more) about technology and usage preference as it is about connection costs. Its simply better and more convenient to send an IM text that do a voice call – and you get to send pictures, share video, do groups etc as well. I think you sort of mentioned that in the article. But banning things helps nothing. It WILL NOT MAKE VOICE CALLING ANY MORE APPEALING. Remember whatsapp got popular way before the bundles. Yes the bundles gave it a push, but it was already huge in Zim, even at that obscene $1 for 10MB price. The bundle was trying to capitalize on its popularity – not grow it. So the statement “thanks to Net Neutrality violations, we love “WhatsApping” in particular” is patently FALSE. We already loved whatsapping! So can you net neutrality groupies stop blaming bundles for everything PLEASE!!! As for those voice revenues, the’re gone and they are not coming back! It’s called the PRODUCT LIFECYCLE (google it) and that particular product is well in the decline phase. Partly because of costs, but IMHO mainly because other form of communicating are more desirable/appealing/convenient. Embrace the new, and grow with it. Their mistake was that they were late to the DATA party – that’s EVERYBODY including Econet. But the tech was already there and waiting. Remember how late mobile internet came to Zim? But so many people had capable devices already. So if they had gotten onto data sooner, it would have grow enough by now so that the decline in voice would not be so biting. But because they were so late, data services are still in the “less steep” growth part of that PRODUCT LIFECYCLE curve (I told you to Google it) while the voice is deep in decline – and there is nothing to cover that gap. But banning anything is a recipe for disaster. Very true! From another world, l have unlimited voice calls and limited data package. My SP adapted a while back and they noticed data packages ar the future than voice. If l want more data, l have to get a package which cost a little bit more. About 3 months ago l was complaining about my SP not able to give me data roaming in Zim, now they have it, thats what we call moving with time. Compare that to local MNOs who upto now are struggling to handle whatsapp and formulate a strategy. Compare that to our tech guys still talking about net neutrality with whatsapp in mind! To many ifs then blaa…..
Are you talking about blocking whatsapp totally, or increasing tariffs/reducing data bundles? This writer has no clue. Absolutely no clue hope he isn’t on payroll. Banning Is not a solution ko iko ku America kwakagadzirwa whataspp yacho haina ku bannwa wani how ana Verizon and AT&T are they surviving MNO ngavakopewoka! Ungasvika kupi uchitiza? when i read the headline i was like oh this must be serious then i went through the poorly written article , waste of time , government will never block whatsapp in Zimbabwe. what happened to kabweza he used to write Very Gud articles.sometimes it is not about the number of articles but the content. Some of these writers should go and get the new and improved anointing oil. maybe we will get better articles. Econet is already blocking whatsapp calls..
Lad, you can make whatsapp calls using Econet Internet Bundles and not whatsapp bundles. shallow article ,the writer signs off by advocating for the move.Is that journalism.In any case the ban will have no merits because even if the app was banned who says people are going to call more.There is no market research that can prove that.It is at most a stop gap measure which would only make the cash strapped people look fr cheaper alternatives to talk.Besides whatsapp given Zimbabwes terrible mobile connections is not operating at its prime hence people still call when the business they want is urgent or requires a more personal and dignified touch as a voice call.So I submit bark another tree not this inane issue. Very misleading article indeed.Besides some people use app from a PC or laptop how do you block it ? 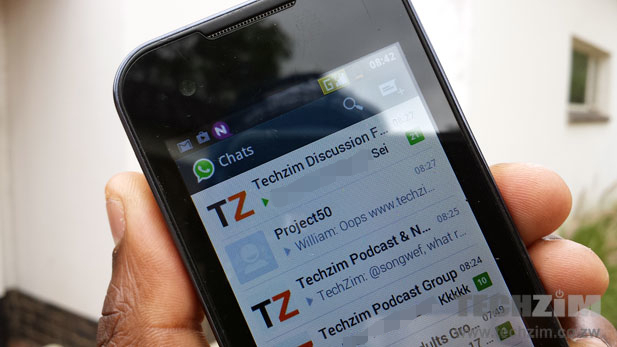 Please techzim avoid posting thread bare articles like these.Does the writer even know what protocol Whatsapp uses and that u can use it as long as you have an IP connection with no MNO. POTRAZ might have challenges but certainly are not dumb to make an attempt to ban it.